We’re in the heart of fall, which means everything we review must be pumpkin. I kid, of course. Not everything has to be pumpkin. It just so happens that a lot of the stuff we’ve been reviewing lately is pumpkin. But that’s because most of the limited edition snacks and beverages out now are pumpkin or pumpkin spice flavored. Today’s pumpkin offering is, I think anyway, one of the more unique pumpkin items available this year: pumpkin seed tortilla chips. We found them when we were wandering around Aldi looking for appropriate snacks for our fall party. Unfortunately Simply Nature is an Aldi exclusive brand, so if there isn’t an Aldi store near you you’re going to have to sit this one out. Or have a friend or family member who does have a local Aldi go and buy it for you. Without giving away too much of the review before the “read more” cut, I will say that they’re worth the effort. When you first open the bag you’re greeted with a nice, subtle pumpkin aroma. It doesn’t jump out of the bag and punch you in the face like a lot of artificially flavored pumpkin/pumpkin spice treats do. That’s because these are not artificially flavored (*shock* *gasp*). 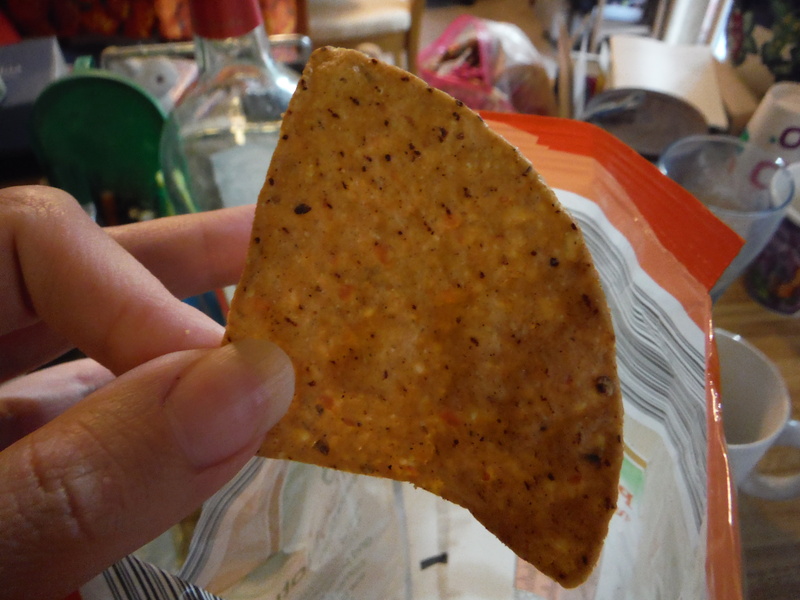 The chips are pretty much standard tortilla chip size in classic triangle shape. They’re a good thickness too. They’re sturdy enough to hold up in dip, but you’re not going to break a tooth on them. They’re also fairly evenly salted, and with a good amount of salt. They’re not so salty that they’re going to make your lips hurt, but salty enough to satisfy a salty-snack craving. As for flavor…they are so good. They have a nice hint of sweetness to them from the pumpkin, but aren’t carried over into dessert territory (though they could easily be used as an ingredient in a dessert). They taste a little bit like a savory version of pumpkin bread, but crispy. These are honestly some of the best tortilla chips I’ve ever had, and definitely the best packaged ones. The bag we bought for our party was gone by the end of the night; pretty much everyone agreed that they were really good. I suppose the only negative, outside of potential lack of accessibility, is that they’re called “pumpkin seed tortilla chips” but not every chip actually contains whole pumpkin seeds. But if you just think of them as pumpkin tortilla chips instead that criticism goes out the window. These probably aren’t going to be around much longer, so run to your local Aldi and stock up! They’re great to snack on pretty much any time of day. And they even serve as a good base for autumn-themed nachos. 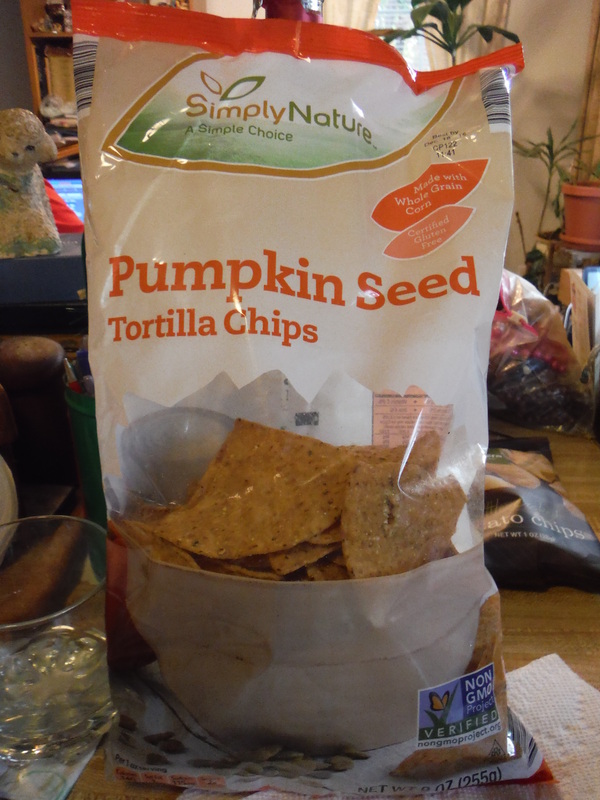 Should You Buy Simply Nature Pumpkin Seed Tortilla Chips? YES!! Posted on October 30, 2015, in The Snack Report and tagged awesome, chips, Fall, gluten-free, pumpkin, review, snacks, vegetarian, yummy. Bookmark the permalink. 1 Comment.